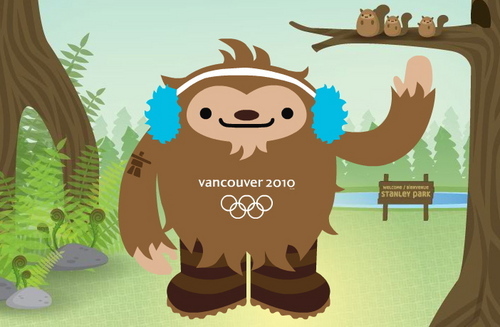 Quatchi is one of three mascots promoting the upcoming Vancouver Winter Olympics, which begin six weeks from today. We love him so much that we created this tribute to him. Quatchi is a young sasquatch who comes from the mysterious forests of Canada. Quatchi is shy, but loves to explore new places and meet new friends. Although Quatchi loves all winter sports, he’s especially fond of hockey. He dreams of becoming a world-famous goalie. Because of his large size, he can be a little clumsy. But no one can question his passion. He knows that if he works hard and always does his best, he might one day achieve his dream. Quatchi is always encouraging his friends to join him on journeys across Canada. He is also often recruiting others to play hockey – or at least to take shots at him! The sasquatch is a popular figure in local native legends of the Pacific West Coast. The sasquatch reminds us of the mystery and wonder that exist in the natural world, igniting our imagination about the possibility of undiscovered creatures in the great Canadian wilderness. Favourite food: Loves to try all kinds! Quatchi, along with co-mascots Miga (a “sea bear,” on the left in the above photo) and Sumi (an “animal spirit,” on the right), made his public debut at the Bell Performing Arts Centre in Surrey, British Columbia on November 27, 2007. 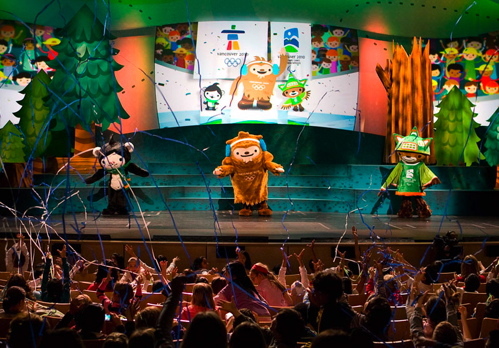 An audience of 800 kids were treated to a fun pageant — first this fantastic introductory cartoon was screened, and then the mascots themselves appeared, dancing around onstage and mugging for the cameras — check the video. Here’s Quatchi demonstrating his goalkeeping skills! Also on hand were mascot creators Vicki Wong and Michael Murphy, collectively known as Meomi — watch this brief interview with ’em. For us, seeing news of the pageant here in Seattle, it was love at first sight. 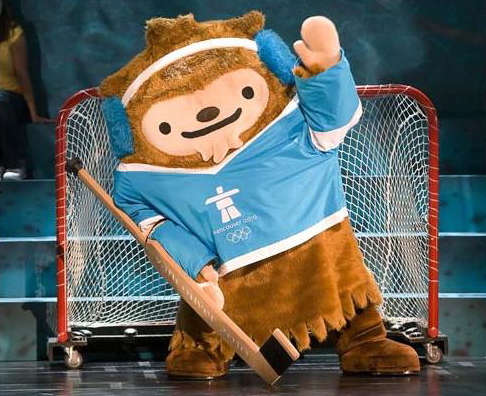 In the two years since, we’ve followed the mascots online as they’ve traveled around Canada to promote the Olympics. And this past September, after discovering here that they would appear at a Langley, B.C. community festival, we met him. Though we’re indifferent about the Olympics themselves, we can’t get enough of Quatchi. He’s adorable in all forms — comics, toys, and with a person inside. 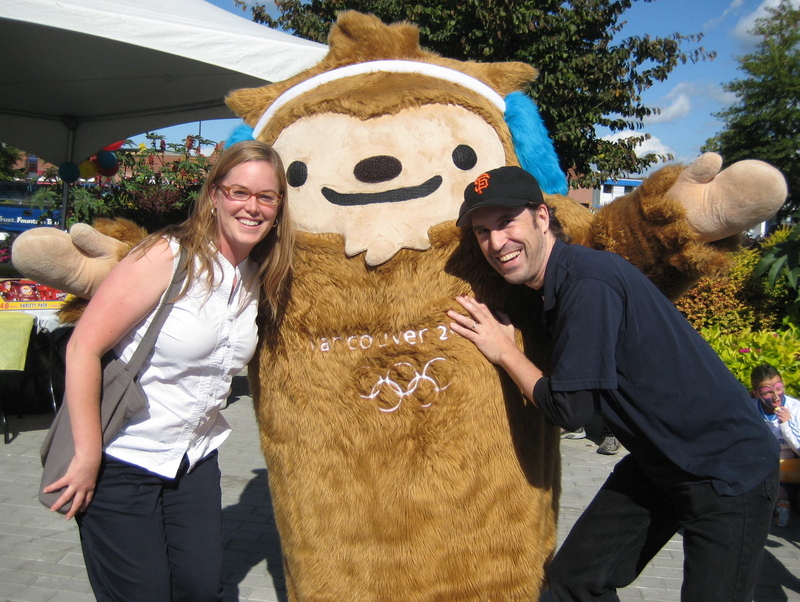 As the Olympics draw near, we’re sure that Quatchi love will spread as the rest of the world discovers him too. Along the way, we aim to document all the photos, videos, and wherever else Quatchi pops up during this exciting time. Unsurprisingly, the Which Mascot Are You Like? Quiz showed that we’re both most like Quatchi. However, we are not furries. This entry was posted in Uncategorized and tagged animation, hockey, Meomi, merchandise, Miga, Mukmuk, Quatchi, Sumi, video. Bookmark the permalink. I am hungry for a Quatchi cupcake! Nice blog, and I want to join the fan club. Keep me posted on Quatchi sitings. Hey, we earned a spot on Tacky Tourist Photos!